A good sunscreen is important to help protect your skin from exposure to harmful UVA and UVB rays. Unfortunately, the most common ones contain chemical fillers instead of minerals. According to the Environmental Working Group (EWG), a nonpartisan nonprofit dedicated to protecting human health and the environment, the two chemical fillers to be most concerned with are oxybenzone and octinoxate. These fillers are both labeled as hormone disruptors. You’ll never find these, or any of the other common chemical fillers (avobenzone, octisalate, octocrylene and homosalate) in sunscreens at the co-op. The mineral-based sunscreens you’ll find here are also free of artificial ingredients such as parabens, phthalates and synthetic fragrances. Plus, they’re biodegradabl and cruelty-free, making your decision a healthy one for you, your family, and our planet. Look for the following chemical-free sunscreens in our Wellness department. 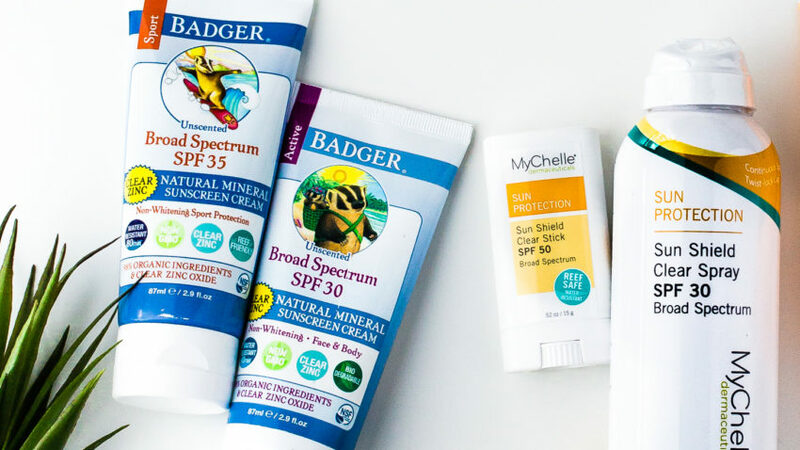 Trade in your chemical-based sunscreen for a free Badger sunscreen that is safe, effective, and made with clean ingredients during our Sunscreen Swap on Saturday, May 18. Contains 98 percent certified-organic ingredients. Clear zinc formula provides effective coverage without the white tint. MyChelle Clear Spray is fast-absorbing and dries clear. MyChelle Sun Shield Stick is great for the face and contains avocado, jojoba, and vitamin E oils to help moisturize and protect.